CRISPR/Cas9 is a technique that allows for the highly specific and rapid modification of DNA in a genome, the complete set of genetic instructions in an organism. 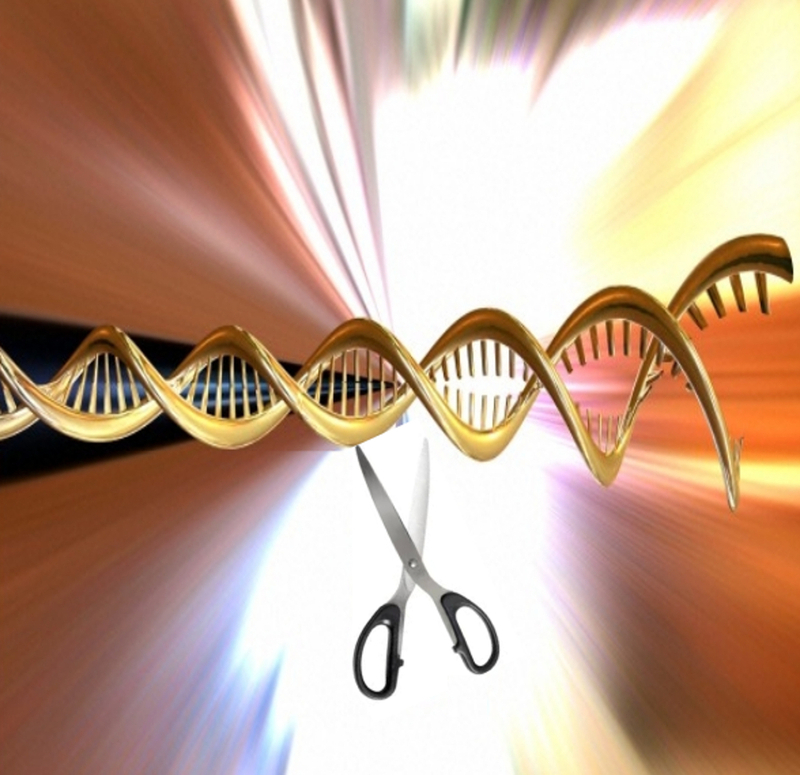 This image depicts genome editing. It is adapted from a DNA illustration by Spooky Pooka. Credit: Wellcome Images. The CRISPR/Cas 9 technique is one of a number of gene-editing tools. Many favour the CRISPR/Cas9 technique because of its high degree of flexibility and accuracy in cutting and pasting DNA. One of the reasons for its popularity is that it makes it possible to carry out genetic engineering on an unprecedented scale at a very low cost. How it differs from previous genetic engineering techniques is that it allows for the introduction or removal of more than one gene at a time. This makes it possible to manipulate many different genes in a cell line, plant or animal very quickly, reducing the process from taking a number of years to a matter of weeks. It is also different in that it is not species-specific, so can be used on organisms previously resistant to genetic engineering. The technique is already being explored for a wide number of applications in fields ranging from agriculture through to human health. In agriculture it could help in the design of new grains, roots and fruits. Within the context of health it could pave the way to the development of new treatments for rare metabolic disorders and genetic diseases ranging from haemophilia through to Huntingdon's disease. It is also being utilised in the creation of transgenic animals to produce organs for transplants into human patients. The technology is also being investigated for gene therapy. Such therapy aims to insert normal genes into the cells of people who suffer from genetic disorders such as cystic fibrosis, haemophilia or Tay Sachs. Several start-up companies have been founded to exploit the technology commercially and large pharmaceutical companies are also exploring its use for drug discovery and development purposes. In 1987 a Japanese team of scientists at Osaka University noticed a strange pattern of DNA sequences in a gene belonging to Escherichia coli, a microbe that lives in the gut. It appeared that the gene had five short repeating segments of DNA separated by short non-repeating 'spacer' DNA sequences. All five repeating segments had identical sequences composed of 29 bases, the building blocks of DNA. By contrast each of the 'spacer' sequences had their own unique sequence, composed of 32 bases. Microbiologists had never seen such a pattern before. By the end of the 1990s, however, they had begun to discover, with the aid of new improvements to DNA sequencing, that this pattern was prevalent in many different microbe species. So common was the pattern that it was given its own name: 'clustered regularly inter-spaced short palindromic repeats' or CRISPR for short. The term was coined by a team of Dutch scientists led by Rudd Jansen at Utrecht University, in 2002, who the same year noted that another set of sequences always accompanied the CRISPR sequence. This second set of sequences they dubbed 'Cas genes', an abbreviation for CRISPR-associated genes. The Cas genes appeared to code for enzymes that cut DNA. By 2005 three scientific teams had independently worked out that the 'spacer' sequences between the CRISP sequences shared similarities with the DNA of viruses and hypothesised that it could be a tool in the defence mechanism of bacteria. Knowledge about how the CRISPR/Cas 9 system worked was opened up by some experiments conducted in 2007 by scientists at Danisco, a Danish food manufacturer later acquired by DuPont. The team infected a milk-fermenting microbe, Streptococcus thermophilius, with two virus strains. Many of these bacteria were killed by the viruses, but some survived and went on to produce offspring also resistant to the viruses. On further investigation it appeared that the microbes were inserting DNA fragments from the viruses into their 'spacer' sequences and that they lost resistance whenever the new 'spacer' sequences were cut out. In 2008 Eugene Koonin and colleagues at the National Center for Biotechnology Information in Bethesda, Maryland, demonstrated for the first time how the CRISPR/Cas 9 mechanism worked. Whenever bacteria confront an invader, such as a virus, they copy and incorporate its DNA segments into their genome as 'spacers' between the short DNA repeats in CRISPR. The segments in the 'spacers' provide a template for the bacteria's RNA molecules to recognise any future DNA of an incoming virus and help guide the Cas 9 enzyme to cut it up so as to disable the virus. Four years later, in 2012, a small team of scientists led by Jennifer Doudna, University California Berkeley, and Emmanuelle Charpentier, University of Umea, published a paper showing how to harness the natural CRISPR-Cas9 system as a tool to cut any DNA strand in a test tube. A year later, in January 2013, a number of researchers at different laboratories published papers within a few weeks of each other demonstrating how the CRISPR/Cas 9 system could be used to edit genomes in human cells. This included teams led by Doudna, Feng Zhang at MIT-Harvard Broad Institute, and George Church at Harvard Medical School. A number of changes are now underway to improve the accuracy and efficiency of the CRISPR-Cas 9 technique. A key breakthrough has been the development of new Cas9 fusion proteins to act as base editors. The fusion proteins make it possible to convert cytosine to uracil without cutting DNA. Uracil is subsequently transformed into thymine through DNA replication or repair. The first base editors were generated in 2016 by Alexis Komor and colleagues in the laboratory of David Liu at Harvard University. The CRISPR/Cas 9 system was first exploited by Danisco in 2008. The company used it to improve the immunity of bacterial cultures against viruses and many food manufacturers now use the technology to produce cheese and yoghurt. Since then the technology has been used to delete, insert and modify DNA in human cells and other animal cells grown in petri dishes. Scientists are also using it to create transgenic animals such as mice, rats, zebrafish, pigs and primates. Between 2014 and 2015 scientists reported the successful use of CRISPR/Cas 9 in mice to eliminate muscular dystrophy and cure a rare liver disease, and to make human cells immune to HIV. It is also being investigated in conjunction with pluripotent stem cells to provide human organs from transgenic pigs. Such work is directed towards helping solve some of the shortage of human organs for transplant operations and overcome some of the side-effects caused by organ transplantation such as graft-versus host disease. The technology is also being investigated as a means to genetically engineer insects so as to wipe out insect-borne diseases such as malaria, transmitted by mosquitoes, and lyme disease, transmitted by ticks. In April 2015 a Chinese group reported the first application of CRISPR/Cas9 to (non-viable) human embryos. This development, together with the decreasing costs of the technology have triggered a major bioethical debate about how far the technology should be used. The technology faces two major issues. The first issue is a philosophical dilemma. It centres on the extent to which CRISPR/Cas9 should be used to alter 'germ-line' cells - eggs and sperm - which are responsible for passing genes on to the next generation. While it will take many more years before the technology will be viable to use to create designer babies, a public debate has already begun on this issue. So great is the fear that some scientists, including some who helped pioneer CRISPR/Cas9, have called for a moratorium on its use in germ-line cells. The second issue is one of safety. One of the major problems is that the technology is still in its infancy and knowledge about the genome remains very limited. Many scientists caution that the technology still needs a lot of work to increase its accuracy and make sure that changes made in one part of the genome do not introduce changes elsewhere which could have unforeseen consequences. This is a particularly important issue when it comes to the use of the technology for applications directed towards human health. Another critical issue is that once an organism, such as a plant or insect, is modified they are difficult to distinguish from the wild-type and once released into the environment could endanger biodiversity. Policy-makers are still debating about what limitations to put on the technology. In April 2015 the US National Institutes of Health issued a statement indicating that it will not fund any research that uses genome editing tools such as CRISPR in human embryos. Meanwhile, the UK's Human Fertilisation and Embryology Authority, under whose remit such research would fall, has indicated that the CRISPR/Cas9 technology can be used on human-animal hybrid embryos under 14 days old. Any researcher working in this area would need to first get a license from the Authority. Other leading UK research councils have indicated that they support the continued use of CRISPR/Cas9 and other genome editing tools in preclinical research. As regulators debate what restrictions to enforce with CRISPR/Cas9, the technology has become the subject of a major patent dispute. The first application to patent the technology was filed by DuPont in March 2007 (WO/2007/025097). This covers the use of the technology to develop phage resistant bacterial strains for food production, feeds, cosmetics, personal care products and veterinary products. Since then three heavily financed start-up biotechnology companies and half a dozen universities have filed patents. Two major competing patent claims have been filed in the US. The first, filed on 25 May 2015, is grounded in the work led by Jennifer Doudna at the University of California, Berkeley, and Emmanuelle Charpentier, originally at the University of Vienna and now at the Helmholz Centre for Infectious Research in Germany. The application has 155 claims and covers numerous applications for a variety of cell types (US Patent Application No. PCT/US2013/032589). The second, was filed by MIT-Harvard Broad Institute on 12 December 2012 for the work of Feng Zhang which focused on the use of CRISPR/Cas9 for genome editing in eukaryotic cells. It was given fast-track status and was granted on 15 April 2014 (US Patent No. 8,697,359). In April 2015 Charpentier and the Universities of California and Vienna filed a challenge to the patent with the US Patent and Trademark Office. It will take several years for the patent dispute to be settled. This profile was written by Lara Marks with generous input from Silvia Camporesi, Xiofan Zeng and Jonathan Lind. New protein, Cpf1, found, offering means to simplify gene editing. Research published demonstrating how CRISPR-CAS9 can be used to eliminate HIV in infected mice.